On June 13, 1997 in Fort Belvoir, Virginia; beloved husband of Margaret A. Oden; father of Delk Oden of Irving, Texas, Peggy Hamaker and Ray Oden, both of Arlington, Virginia. He is also survived by seven grandchildren. A memorial service will be held at Fort Myer Post Chapel on Monday, June 23 at 9 a.m. full military honors. Memorial contributions may be made to the American Cancer Society. He was a 1937 graduate of USMA West Point. 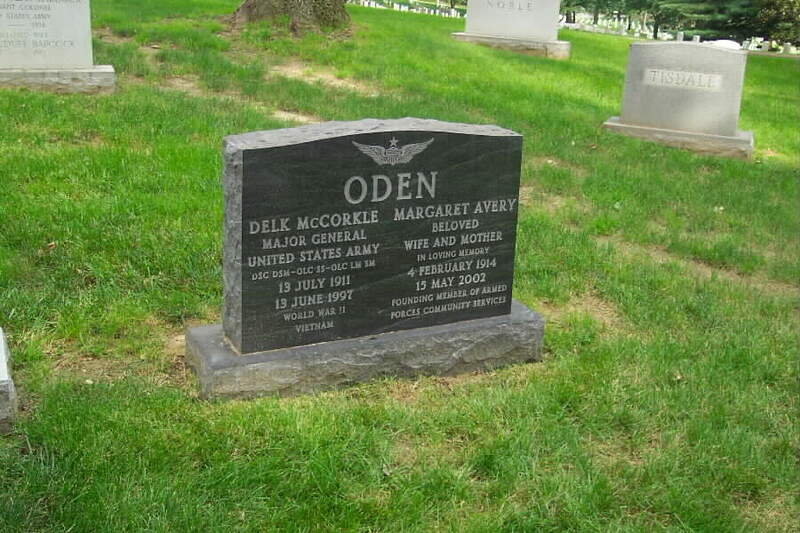 General Oden was buried with full military honors in Section 30 of Arlington National Cemetery. His wife, Margaret Avery Oden, 4 February 1914-15 May 2003) a founding member of Armed Forces Community Services, is buried with him. Delk M. Oden, Major General (Retired), Honorary Colonel of the 35th Armored Regiment, recently passed away. His battalion was the sister unit to the renowned 37th Tank Battalion, seeing virtually the same action throughout the 4AD s triumphant sweep across Western Europe. The notification came from another, much later commander of the 35th Tank Regiment, who learned in his generation from some of the lessons forged in battle by General Oden. This current tanker, whose professional life was directly touched by General Oden, asked that some mention be made of the passing of one of our Armored Forces truly great combat leaders. You see, more and more of these great men are passing away now as their age group passes the 80- year mark and move toward 90. They take with them their tales of battle, perseverance, and bravery. And they are stories worth hearing. Colonel Moncrief, an ex- 6th Armored Division soldier, self-published his work because he thought it so important to tell his tale.